Bristol food blog. Come read about our adventures cooking and dining and occasionally wining out in our fair city of Bristol. Restaurant reviews, recommendations plus food and drink tasting in and around Bristol. My love affair with Japanese food is well documented. When I walked past the window of Poké Shop, where Hanoi Coffee Company used to be, I was thrilled. Poké bowls in Bristol? Surely just a fantasy of the future? But no. Poké bowls have been speeding up the trend food charts faster than a coyote after a roadrunner. The Hawaiian/Japanese crossover was already a household name in California and the like but is still fairly new to the UK. Poke bowls are a raw fish salad, mostly spicy tuna, salmon or octopus it is also filled with rice and pickled veg topped with a number of items such as spring onion, sesame seeds, avocado and crispy onions, but the list is fairly extensive to what you can top your poke bowl with. The first place to offer poké bowls is by the owners of ramen joint Sticks n Broth. The Poké Shop in Bristol offers Spicy Tuna and Salmon as their fish options currently but they come with 5 different selections of toppings. I have so far sampled the Oki poke and the smoky poké. Poké bowls are a great lunch alternative to those who enjoy raw fish. The idea is you poke around in the bowl and see what combo you come out with. This has fast become a firm favourite with work friends for a healthier lunch alternative that tastes delicious. Being able to enjoy a sushi vibe without having to spend a tonne of money on a set or selection of dishes. My smoky poké for example had raw and smoked salmon, seaweed, edamame, spring onion and sesame seeds topped with Japanese mayo. If you can’t decide what poké to have they also offer a tuna or salmon lunch poké bowl which is filled with whatever they fancy on the day for £6.50. The Poké Shop also offer sushiritos, a sushi burrito with rice instead of tortillas, although they have just started trying out Japanese style fish tacos which sound pretty interesting. The sushiritos needed a tighter roll and a bit more work before the reach the levels of the one I had at Sushirito in NYC but the idea is a good one and I hope they work at it because I personally can’t get enough of this concept and am looking forward to seeing more poke bowl options in the future. If you are looking for more details about the Poké Shop, visit their twitter account @pokeshopbristol. I am always particularly happy when I hear of new restaurants opening up near my flat. Partly because I am lazy but mainly because I enjoy eating at new places, obviously. So when Pizza Workshop opened up on Whiteladies Road I was somewhat excited. I had heard good things about their first venue on North Street and was looking forward to trying it out. The restaurant is pretty small but no smaller than Flour and Ash. Pizza Workshop have 10 pizzas on their menu as well as weekly specials listed on their blackboard. At lunchtimes they offer Boccas, a calzone/panini experience, all £5 each with a variety of fillings leaning from the more traditional Italian to British fried eggs and bacon. The dough they make is the now almost universally present sourdough, but unlike some of the most popular places at the moment they do not have as much of a raised crust. Pizza Workshop also offer gluten free bases which will be a relief to a lot of people. Most of the pizzas are tomato based but they do offer one white based pizza with lots of mushrooms and truffle oil. I sampled a number eight which is prosiutto, salsiccia, chorizo and n’duja, basically a meat feast. 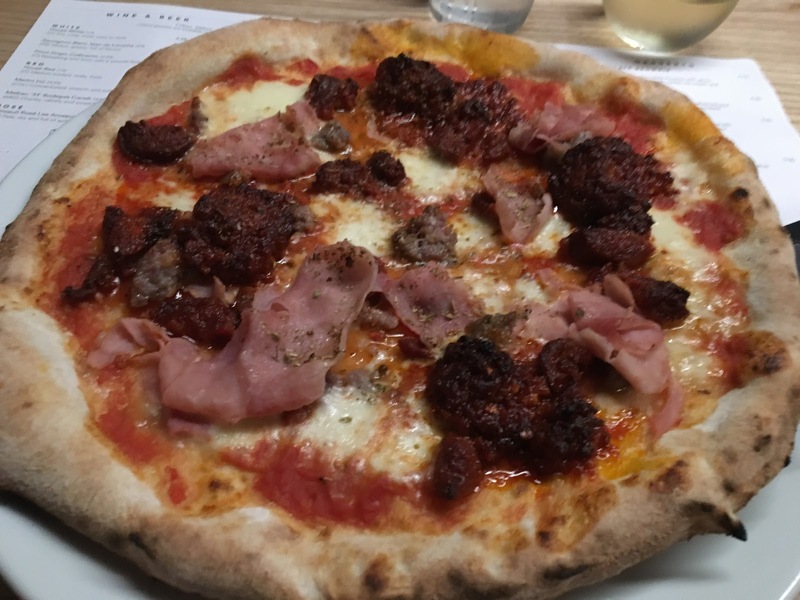 N’duja is becoming more prevalent on pizzas these days but I personally could see more places offer it because it’s simply delicious, spicy and meaty, and perfect for pizza. 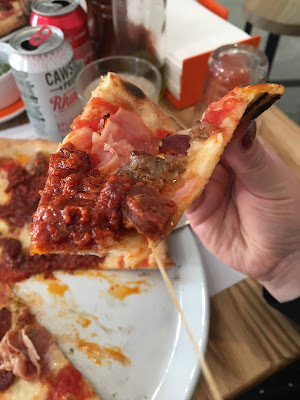 The base is chewy and enjoyable, I didn’t leave many crusts which is a good sign for me. I was also able to request for some mayonnaise to dip them in. They make the mayo fresh and it is extra indulgent with chewy pizza edges. Although dips are not offered as standard in Pizza Workshop you should definitely ask them for a dollop of their mayonnaise because it will enhance your pizza experience. To think that dips in a pizza restaurant were not that common place a few years ago but thankfully due to countless suggestions and feedback from social media and the love people have for Domino’s garlic and herb dip more restaurants are starting to offer dips as an add on. Although it would be good if a standard dipping sauce was offered included in the price of your pizza and the ability to upgrade was there instead, but this is just my opinion. The number eight pizza was one of the best meat feast pizzas I have had in Bristol because it the toppings were so tasty and plentiful. 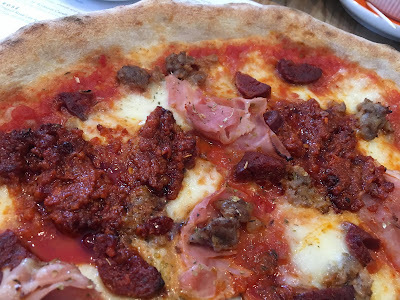 They certainly weren’t shy with the n’duja, I know I go on about it, but it is sublime. The dough isn’t my favourite from the ones the city has to offer but it was very good. I am so glad to have this pizza place on my door step, the generosity of toppings alone are worth the visit. They mostly stick to the standard Italian meats and veg on offer, toppings wise, but there is something for most tastebuds here. We have a lot of pizza restaurants in Bristol and each has their own loyal following of fans. The best ones offer something different so you can have a selection to rotate, depending on your preference on a particular day. I am fairly sure this one will enter my rotation under the, close by and traditional. To find out more about the pizza selection check out their website. After my first run in with chaat at Sholay I was interested in trying other examples of this dish. Gopal’s crowdfunded their permanent home at Wapping Wharf and after reaching their goal, thanks to many loyal fans they opened up about 6 months ago. Sporting an all Vegetarian and Vegan menu that will warm you through the Wintery months. A menu of Indian street food with dishes such as a selection of dhals, the Mumbai toastie as well as seasonal curries. With chaat on my mind I went in to order the samosa chaat dish. Whilst a good deal of the cargo containers are designed for takeaway, and Gopal’s is no exception, there are a couple of stools to perch on. Gopal’s samosa chaat consists of crushed up samosas topped with spicy chickpea curry topped with various chutneys, yoghurt and pomegranate seeds. At £7.50 it might seem a little pricey for lunch but the portion is enormous, if you can finish it in one sitting you are a hero to me. This was just what the doctor ordered on such a grey day, and we had braved sitting outside. The chickpea curry was a tad hot but I popped back in and they gladly gave me a pot with extra minty yoghurt to cool it down. This dish is wholesome, warm and comforting. The samosas are still slightly crunchy and add a nice texture, and the fig and tamarind chutney adds a wonderful sweetness. Because the flavours change with each mouthful it was a delight to eat, and even when I was full I still wanted to go back for another mouthful. I find it really heartening when street food stalls build up enough of a following to open their own permanent premises and Bristol is lucky enough to have converted the dreams of many a street food favourite. It was something I wrote about last year for Wriggle, our love affair with street food doesn’t seem to be showing any signs of a cooling off period. Check out the article here. Gopal’s shows how imaginative Vegetarian and Vegan dishes can get. The vibrancy and flavours certainly don’t make you miss meat at all. I am looking forward to exploring more of their menu over the next few months whilst we endure more freezing temperatures. To find out more about their food visit their website. Gopal's will also cater for events and parties if you are looking for something a little out of the norm. The most recent restaurant opening at Cargo 2 is Sholay. An Indian kitchen from the owners of The Mint Rooms with a more casual approach to Indian cuisine. Named after the 1975 smash hit Hindi language film, Sholay is regularly named in the top 10 lists of best Indian cinema. Sholay, the restaurant, has quotes and scenes from the film painted on it’s walls. The menu consists of snacks and medium sized plates, with the idea that you order a few and share. Whilst there will be some dishes on the menu that are recognisable to those that are fairly familiar with Indian food there are a lot of different ones to explore. My companion for the evening was Annupa, to help me guide my way through the unfamiliar and cast a focused eye on what was offered up. We decided upon the Sholay chaat. Chaat is a street food dish but also one that is served with many other dishes, it’s rather hard to describe but it’s sort of like a textured salad, normally made from samosas with lots of sauces. We also ordered some vegetable patties (sabzi ki tikki), baby aubergines in yoghurt and coriander(dhal baingan), grilled poussin with a pepper sauce(tawa poussin) and paneer and chutney sandwich. Most of the dishes hover around the £7-8 mark and there are plenty of vegetarian options too. As with most places that offer small plates the dishes appeared when they were ready, which when you’re sharing is not so bad because it means you don’t have to stare misty eyed and longingly after plates being placed in front of your dining companion whilst your setting remains empty. The chaat was first to arrive and as this was my first experience of this dish I wasn’t sure how to take it. It was fresh, zingy and moreish. I was assured that this was not exactly how it was supposed to be with the samosa bits being more like thick poppadoms and the crispy topping being more thick. We did enjoy it however and it was probably one of the best dishes of the evening. The sabzi ki tikki, vegetable patties, whilst crisp were in my opinion pretty bland and we were disappointed to have ordered them. The sauce that accompanied them had a nice depth of flavour with the dot of beetroot sauce giving a nice sweet earthiness, a much needed boost to the otherwise fairly plain patties. Our other favourite dish of the evening was the baby poussin. The bell pepper and onion sauce that accompanied it was tangy but with a good kick of chilli. The poussin itself was juicy and full of flavour, definitely one to order if you end up visiting. The only thing wrong with this dish was the rice was quite dry instead of being fluffy. The other bigger dish, the baby aubergines with a yoghurt and coriander sauce was a bit of an odd one. Aubergines can be extremely flavourless, they aren’t one of my favourite vegetables but given some love they can be transformed. The sauce was grainy and tasted of very little. What those aubergines needed was a dollop of the poussin sauce to bring them alive. We left some of the dish because it just didn’t work for us. It’s no secret that Wapping Wharf is knocking it out of the park with their food offerings. I have only tried a small number of them but everything I have had so far has been pretty special. So when Kym messaged me to tell me we had to go to Cargo Cantina, I sat up and listened. The brains behind Bravas set their sights on Mexico’s favourite snack, the taco. The menu consists of five different types of taco, plus sides to go with them, and some specials. To make it simple everything here is gluten free. From the blue corn tacos to the chilli sauces. If you like tequila you are well provided for here, they offer up a variety of ones to sample and some cocktails for those who don’t want the mixers for their spirits to just be salt and lime. As with much of Wapping Wharf booking is not offered but Kym and I sauntered up in the rain with hope and a dream and we were welcomed in by two handsome angels just as two spots at the bar opened up. It was kismet, one might say. As Kym had been here before I followed her lead. For £18 a head you can get all five of the regular tacos with all the sides and salsas, which is just as well because I enjoy a full sample of a menu. A tray of delights was brought to us shortly afterwards, blue corn tacos make for a moody insta food shot I can tell you. Being able to build your own combination of taco means that every experience will be different but the food is nothing short of superb. One of my surprising favourites was the avocado and cactus the ancho chilli gave it a real warmness and was bursting with flavour. The slow cooked meat options of pork shoulder, pibil style and the rich ox tongue and cheek, braised overnight, melted in the mouth. The food is fresh, clean and moreish. The only filling that didn’t shine for me was the seafood mix of octopus and prawns. To me it could have had a bit more oomph, octopus can be sublime and I could have taken a smokier flavour. Cargo Cantina’s food excites and judging by the constant queues of an evening, the rest of Bristol agrees. I can’t wait to return and sample some of their specials. Bare in mind you cannot book tables at Cargo, it’s small so is a turn up and see affair. With some great food options at Wapping Wharf you won’t go hungry if you can’t get a spot at your first choice, you should be able to find something just as good and a new favourite behind door number two. To see what Cargo Cantina has to offer visit their website. What feels like Bristol’s umpteenth burger restaurant, Hubbox opened this Summer to a few teething problems but soon they were smoothed out and serving burgers to the citizens of Whiteladies and beyond. One Sunday when we were hungov.. tired and emotional we managed to drag our carcasses off the sofa in search of salt and a hope that one day we might be able to be out in sunlight again without wincing. We stumbled in to Hubbox to check out the latest new burger in town. Hubbox does offer up a selection of beef, chicken and veggie/vegan burgers but it also has the choice of two fish burgers which is something a little different. You can also order hotdogs, some barbecued items as well as loaded fries, wings and mac n cheese. As is the current trend burgers do not come with sides but as the burgers hover around the £8 mark adding on fries doesn’t make this too pricey. I have been here three times in the past few months and here are my findings. Their Kim Yum Chick, Korean influenced fried chicken burger really is something special. Spicy, tangy Korean mayo sauce and a particularly crunchy batter elevate this for me. To be honest I will only ever order this burger I can’t see anything topping it at Hubbox. I tried the Brie B King, chicken breast with brie and caramelised onions and garlic mayo, it was pretty nice but not enough to order again. The portion of fries is a little small in my opinion but when shared with a partner in crime with some mac n cheese (I recommend the blue and bacon) it does fill you up nicely. When you have so many burgers to choose from you do start minutely detailing how they differ from each other. Hubbox doesn’t crack my top three but you know what? That fried chicken burger is enough to get me back there especially with a hangover the size of Brazil. They offer up just few different things to give it a second glance over the behemoth that is Bristol’s Burger scene, of which I still have many more offerings to sample. To find out more about Hubbox visit their website. Greek food. Often relegated to the post beer kebab category strips of greasy mystery meat that tops a grilled pitta glistening with intent and lots of garlic mayonnaise. You want a kebab now don’t you? But it gets a bad rep being the drunk’s choice, Greek food, done right is a wonderful thing. Bristol doesn’t have much in the way of decent Greek restaurants, maybe 4 ish at most, the somewhat secret Cyprus Kebab House being a particular favourite of mine. However Cargo 2 has come to the rescue with the arrival of The Athenian. Athenian already has a few openings across London, including Boxpark, the first shipping container retail and dining mall which Wapping Wharf is based on. What the Athenian is offering up is souvlaki. Souvlaki are derived from the Turkish doner kebab, in fact gyros comes from the word to spin. The Greeks have made them their own by adding fries into the meat and salad combo. The Athenian offer options for carnivores, veggies and vegans alike. You can choose from beef and lamb bifteki, the Greek word for kofte, chicken, pork, halloumi, mixed veg and mushrooms. It also offers options for varying states of hunger. Which is lucky because I am usually ravenous. Each main filling comes with a designated sauce, chicken for example comes with a honey mustard style one, and the kofte with a light tzatziki. There is also the option to add extra meat and/or halloumi. The halloumi is proper imported Hellenic stuff and it’s texture is a lot firmer and more delicious than what you can buy in the supermarkets, so well worth a punt I’d say. I sampled the kofte on my first visit along with a side of oregano fries and some of the feta and smoked chilli dip, which I believe is the accompaniment for the pork. I also opted for a chunk of halloumi to make sure I sampled my first gyros by The Athenian, properly. After several visits to the Athenian I can categorically say that this is a great place to get a quick and tasty feed. Certainly a welcome sight if you are hungover and have to count on Deliveroo bringing tasty Greek treats to your door, they travel very well. But it’s nicer if you can visit in person, plus if the sun is shining you can grab a cool drink and watch the boats wizzing up and down. BBQ Pork loin with pumpkin and pear - Autumnal BBQ pork loin with pear and pumpkin smoked over maple. The post BBQ Pork loin with pumpkin and pear appeared first on CountryWoodSmoke.